Cahir native Charlotte English was the overall winner of the WIT Land Management (Agriculture) Award sponsored by Allied Irish Banks plc (AIB). Currently in final year of her Land Management programme at Waterford Institute of Technology (WIT), Charlotte received the highest grade for her research project and presentation which focused on the milk composition produced from different aged lactating ewes. Shane Whelan, AIB Agri Specialist announcing the award winner said “AIB are delighted to partner with WIT in this, the first year of the AIB / WIT Land Management (Agriculture) Awards. We have been very impressed by the quality and standard of presentations and by the confidence of the students we met here in WIT”. Speaking on behalf of WIT, Dr Tony Woodcock, Agriculture lecturer in WIT said "I am absolutely delighted that AIB have decided to come on board as a sponsor of WIT's Agriculture courses. Having such a prestigious prize on offer for the students in their final year is a fantastic goal for them to aim for, and it's something that will look great on the winner's CV. I'm also very proud of the calibre of students that presented here today, and it's fantastic that they get the opportunity to present the outcomes of their final year projects to external industry representatives like AIB, to give them an idea of the level of excellence being achieved in WIT." 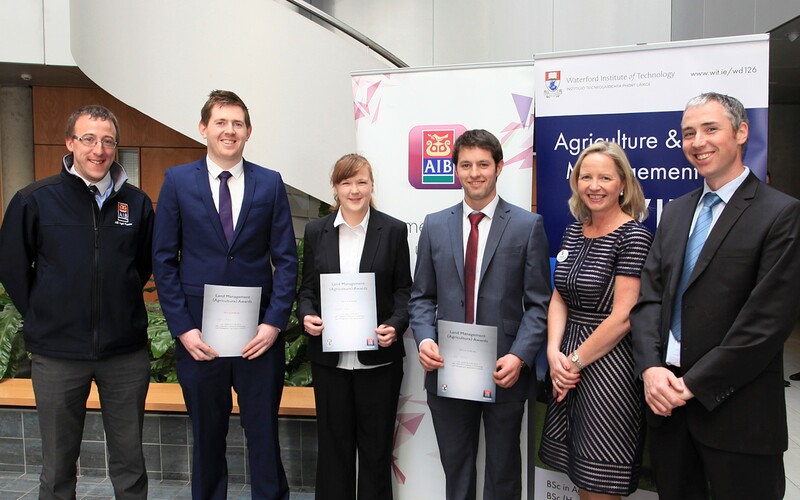 Charlotte was presented with her €500 AIB Land Management (Agriculture) Award at a special Award’s Cermony in WIT on Monday 16th along with numerous other high achieving students.